Costa Rican Trails offers you the option to buy the supplies you want to donate locally in Costa Rica, like rice, beans, oil, salt, fruits, Gerber baby food, Gerber cereal, milk, and formula. If you are interest pleased contact your Sales Consultant or email info@ reservations@costaricantrails.com directly. Centro de Promoción Comunitaria San Martin de Porras promotes the holistic development of 280 children from ages 1 through 12 years old in La Carpio, Costa Rica. Through education, nutrition and kindergarten services, families are strengthened and initiatives such as social justice, equal opportunity, solidarity, cooperation, creativity and personal development are promoted. 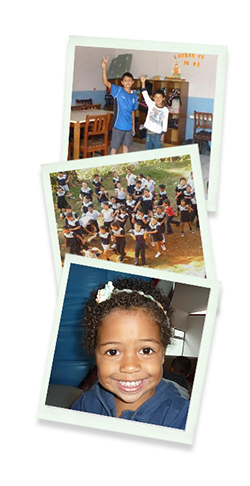 Lomas de Cocori­, located in the district of San Isidro de El General, serves 338 students from ages 4 through 12 years old. Cen-Cinai Zapote is a kindergarten located in Zapote, which cares for and teaches 66 children while their mothers are at work. Union los Hogarcitos is a group of seven Hogarcitos, located in San Jose. Each one of them takes care of ten children up to 6 years old. They receive the children from PANI, a Government Children Organization. and take care of them until PANI solves their family issues and the child either is adopted or goes to a relative who can take responsibility for the child. We take care of little children constantly searching for donations to meet all of the childrens’ needs so that they can have a normal life in a family.